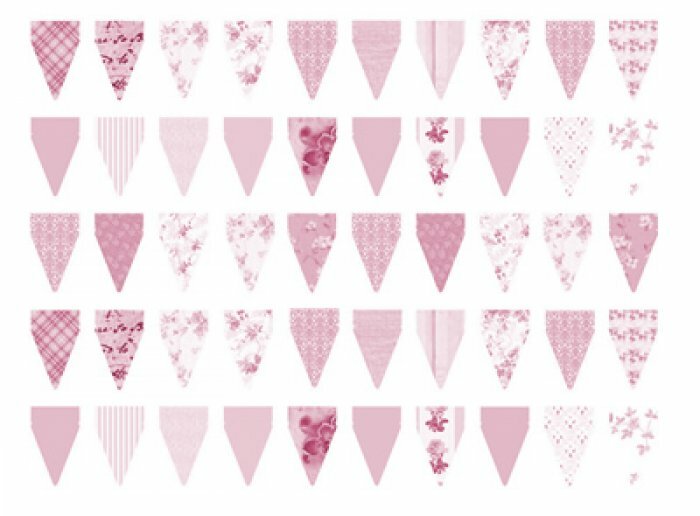 Beautiful vintage inspired Wafer Paper Edible Bunting. 2.5cm drop on each flag. Has an fold flap that if you want to fold over string you can. Glue with edible flower glue or royal icing. Or attach straight to the cake or cupcake with piping gel, royal icing or flower glue. You cut them out with sharpscissors or a stanley knife. You can cut the fold line, or you can cut the fold line off if you would prefer to attach them straight to the side of the cake. So vintage chic, so edible, so gorgeous! Two sheets of 30 flags each - 60 in total, that have to be cut out - with pink hues! PLEASE NOTE, COLOURS CAN APPEAR DIFFERENTLY ON YOUR SCREEN TO HOW THE ARE PRINTED ON WAFER PAPER. Wafer paper has a rougher texture and can be semi translucent when held up to light.